The vertical farming movement is pushed forward by visionary thinkers and enterprising personalities. But they do not necessarily have to be farmers or scientists; one of vertical farming’s greatest characteristics is its inclusivity. By opening the world’s biggest industry to people from all corners of expertise, the capacity for productive thinking and innovation is boosted. This would appear to be the most effective way to go about solving the problems facing the world’s food supply. 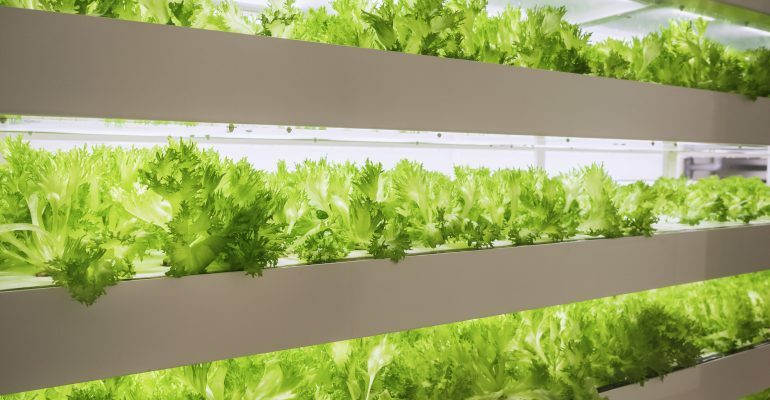 Case-in-point: Farmers Cut, a company based in Hamburg, that has taken a completely original approach to growing vertically with its patented Dryponics system. I caught up via e-mail with Isabel Molitor, the company’s “Chief Impressions Curator” (Co-founder and CMO), to give us some insight into the origin of her innovative company. When starting out, how did you conduct your market analysis? IM: When we started out about three years ago, we looked into the key markets of indoor vertical farming – particularly the US and Japan. Being convinced of the potential of IVF, we wanted to get to know the competitive environment and available technologies. We traveled around the globe hoping to find a company that could offer a turnkey solution that we could bring to Germany to simply become an urban food supplier. We started conversations with various companies, from the engineering, electronics, horticulture and IVF sector expecting to get a technology that offers full automation, full climate control and modularity to scale accordingly. However, deeper market research showed us that no one would truly meet our technological expectations. Thus, after many dead ends and disappointments, we decided to develop our own technology to get what we wanted. During this market analysis, at what level did you find consumer awareness regarding urban agriculture, specifically the benefits of vertical farming? IM: It was very much in the US where we sensed the increasing demand for local food supply and the awareness among metropolitans that today’s broken food system has to change. As with many other trends, the awareness is very much coming from the urban population of cities like New York, Chicago and San Francisco, as that is where like-minded people come together to really bring change forward – no matter what context. The increase of farmers markets in cities due to the demand for local produce and traceability is just one example that indicates awareness for urban agriculture, health consciousness and sustainable conservation of our resources. On what basis did you choose the technologies you use and the products you grow? IM: As mentioned above, while we initially were looking for a turnkey solution, it turned out we kind of had no other option than to develop our own technology from seeding to harvesting. When we designed and implemented our Dryponics technology (first as a prototype in Holland, then at large scale as our pilot farm in Hamburg), we were not sure about the specific product range that we could eventually grow. Today, with a running farm and sales, we can confirm that we can cultivate a wide range of greens – from baby leaves, cresses/microgreens, herbs, and salad heads to small vegetables such as turnip and bell pepper. We are continuously developing new plant recipes – and today we have proven to be able to grow over 200 different plants. Some of our favorites are our Spicy Mustard Mix, cresses like Mexican Marigold or exotics like Ice Plant. What measures have been taken to compete with conventional products? IM: Well, at one point we knew that our understanding of the market and the players was well founded – and we pictured the huge potential vertical farming could have for the world. However, we were also aware of the bankruptcies and failures of existing IVF companies. While they paved the way as first movers, we learned from the weaknesses and inefficiencies some of them had. Thus we said if we go into indoor vertical farming with our own technology we must lift IVF onto the next level by 1) increasing the level of automation, 2) eliminating unused/lost space while guaranteeing full climate control, and 3) implementing a truly modular system for global scalability. We believe that with Dryponics we have developed and implemented a technology covering these prerequisites and we are continuously optimizing part of our farm system. Today we have proved our concept, received our patent and have facts showing our technological advancement in terms of scalability, efficiency and plant quality. Can you give us one completely unexpected challenge and how you overcame it? IM: How life goes – the unexpected challenges come from interpersonal relations. In that sense a key challenge was definitely when we realized we had to part ways with one of our early partners due to breach of trust. Despite our close initial partnership, we lost trust in each other resulting in a termination of our partnership agreement. We were in a very critical phase when we were drifting apart as we were 100% expecting their support, also since compliance was still supposed to be ensured by them. However, even with the best contracts and legally binding agreements, at the end it’s the interpersonal relations and reciprocal trust that counts. While parting company was a roller coaster of emotions and operational strains, at one point it turned out to be for the better: We were forced to find the right partners to engage in conduct that is highly professional and trustworthy. It turned out it was the best that could have happened to us, as otherwise we would have never looked for a partner with whom we could really scale as globally as we intend to. What’s next for Farmers Cut? Farmers Cut will be on the Vertical Farming Panel at Greentech 2018. For more information on Farmers Cut, please head to their website here.